You need to configure Internet Information Server (IIS) if you wish to host your HTML report. The HTML reports generated by GenoPro includes Scalable Vector Graphics (SVG) and the .gno family tree. As a result, you need to add the MIME types to your web server to deliver those pages, otherwise IIS will return the error 404 (file not found) even though the file is there on the server. .svg image/svg+xml This is the basic file for the SVG format. .svgz image/svg+xml This is the compressed version of the SVG format. This file is about 10 times smaller than its equivalent SVG file, meaning it is 10 times faster to download. .gno application/octet-stream The .gno file is the native file format of GenoPro. If you wish your report to display an interactive family tree, your server should serve .gno files. The SVG files allow basic interaction such as zooming and scrolling, however the .gno file allows the visitor to double click on every object to bring its properties to view pictures and other details such as birth, death, occupations, sources. .ged text/text The GEDCOM file is included in the report for other genealogy application to import data generated by GenoPro. 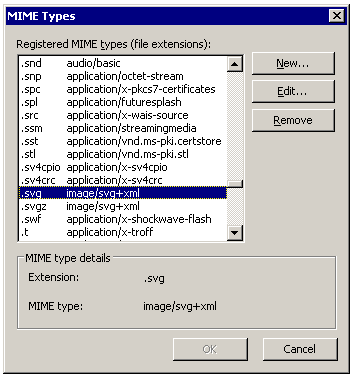 .emf image/x-emf Host Enhanced Meta Files. A metafile is a vector-based image with a transparent background. Metafiles can be scaled to any size without loss of quality. The metafile is ideal for printing since it retains the full quality, and can be included into a graphical application such as PowerPoint or word. Metafiles are extremely compact too, requiring little memory. Some GenoPro reports do generate .emf files, and if you wish to host them on the web, you need to add the .emf MIME type. .djvu image/djvu To host DjVu images. This is entirely optional since GenoPro does not have built-in DjVu images. A .djvu image is somewhat similar to a JPEG image with much better compression. Our server http://familytrees.genopro.com/ supports .djvu images because some of our customers do includes such images within their reports. In IIS, right click on your server and select Properties. Click on the button MIME Types and you will get the dialog below. If you wish to configure a specific website, then click on the tab HTTP Headers and you will see the button MIME Types. Make sure you include all the MIME types you wish to support (.svg, .svgz, .es, .gno) and click on OK. You may have to restart the IIS service to have the MIME types to take effect. GenoPro generates both .svg and .svgz files in an HTML report. The .svgz files are compressed using the Gzip compression algorithm and therefore must be served as compressed files. Since there is no way to specify the Content-Encoding in the MIME types, we wrote a small module to insert Content-Encoding: gzip in the HTTP header when handling a .svg file. Download the ISAPI filter named IsapiForSvgCompression.dll (24 KB). You should download this file into folder C:\Windows\system32\inetsrv\ so this filter can be loaded by IIS with execute permissions. By the way, the website http://familytrees.genopro.com/ has been using this filter to serve .svgz files to our visitors. In IIS, right click to your website, select Properties. Click on the tab ISAPI Filters followed by the button Add. You should get the dialog below. In the filter name, type something meaningful to you such as Compressed SVG (.svgz) and click on the Browse button to locate the file you just downloaded. Click on OK. If you bring back this dialog and the DLL is not loaded, just restart the IIS service.